ABUJA—AHEAD of the establishment of the proposed Nigeria Peace Corps, the Senate has given President Muhammadu Buhari the power to hire and fire the National Commandant General of the corps. Senators are, however, divided over an aspect of its general principles which proposes that only the President can nominate the national commandant of the corps and forward same to the Senate for confirmation. The Senate has also recommended seven years imprisonment or a fine of N100,000 for erring staff of the corps when it finally becomes a new legally-backed organisation by the Federal Government. The recommendations of the Senate were sequel to a report by the Committee on Interior on a bill for the creation of National Peace Corps. Presenting the report in Abuja,weekend, acting chairman of Senate Committee on Interior, Senator Bayero Nafada, said the national commandant of the corps would be answerable to the President and not the Senate as canvassed by the lawmakers. 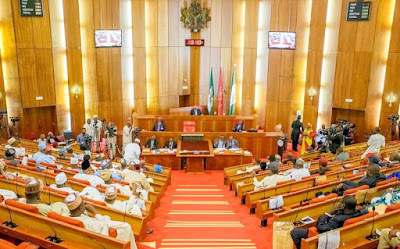 Prior to the presentation of the report, lawmakers, who opposed the proposal of the committee have, however, insisted that the national commandant of the corps should be answerable to the President and not the Senate as proposed by lawmakers. Senators had argued during the earlier debate on the general principles of the proposed law, that the President could only nominate national commandant of the corps and forward same to the Senate for confirmation . In his presentation of the report, Senator Nafada said the Bill for an Act to establish the Nigerian Peace Corps would empower, develop and provide employment for the youths, as well as help facilitate peace and community services as that would give legal backing to the already existing corps nation wide. According to him, when established, besides ensuring peace in the country, it would provide alternative employment for the youths, community development services and nation building. The House of Representatives had earlier passed the bill . The two legislative houses are, however, expected to raise a conference committee to harmonize their differences, if any before it can be forwarded to President Buhari for assent.